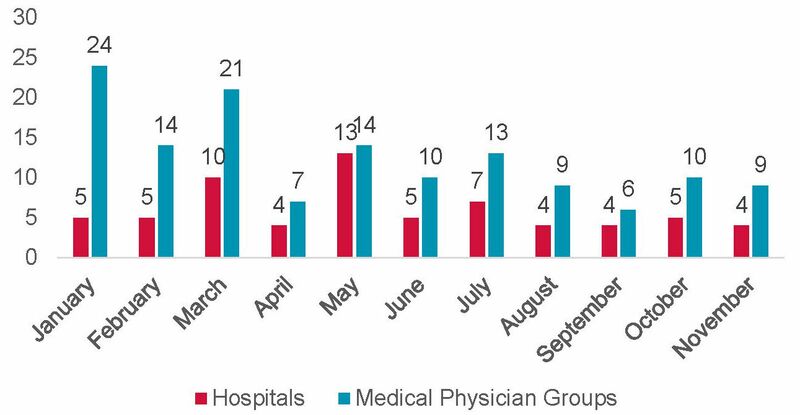 9 physician groups and 4 hospitals were acquired in November 2017. The largest hospital acquired was Merit Health Northwest Mississippi, a 181 bed hospital, in Clarksdale Mississippi which was acquired by Curae Health, Inc. The largest physician group acquired was Northwest Physicians Network in Tacoma, WA with 1,000 physicians, and was acquired by DaVita Medical Group. 2017 M&A transactions for Hospitals and Medical Physician Groups are on a similar pace as 2016.